For a comprehensive distribution strategy, view the webinar, "Developing Your Lead Distribution Strategy". The type of lead distribution method you choose will significantly impact response times and overall conversion, below are several methods that focus on maximizing different goals. Push - Leads are assigned. Pull - Leads are claimed. Push-Pull - Multiple agents contacted, first to respond is assigned lead. 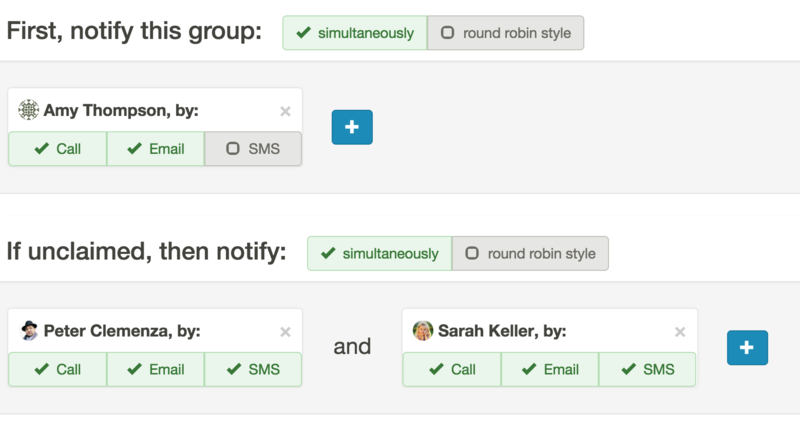 Round Robin (Push) - Evenly distributes leads to agents in order. Top Producer (Push) - Assign leads based on agent performance. Territory (Push) - Assign based on location of the lead / agent. Cherry Pick (Pull) - Agents view leads and claim the ones they want. Blind Pull (Pull) - Agents claim leads without seeing details first. Shark Tank (Pull) - Multiple agents contacted, first to claim lead wins. First To Call Version of All The Above (Push-Pull) - One or more agents contacted, first to call lead wins. LeadSimple does not provide traditional push methods for lead distribution because they are inherently inferior to push-pull based distribution. All of the lead distribution methods below involve notifying one or multiple agents and awarding the lead to the first agent to actually CALL the lead. Once you have selected a lead distribution method you can set that up in LeadSimple. Avoid confusion over lead assignment If you've got multiple agents competing for leads it's best to only send phone and text notifications to reduce the odds of multiple agents calling the lead. Text messages only contain the tracked number, which will alert the agent if the lead is already assigned when dialed and the agent who responds first and has the lead assigned to them will always be sent a lead assignment email notice regardless of whether email notifications are active. Go to the 'Notifications & Routing' page under settings. Set it up to look like this. Agent A will be called first, if they accept the lead no one else will be called. If they ignore the lead, agent B will be called and the process will be repeated. The next time a lead comes in Agent A will be called last and Agent B will be moved to the front of the line. If no one responds and the default assignment option is left empty the lead will be left unassigned. The default permission setting allows agents to view and reassign leads. Agents A, B and C will all be called and texted simultaneously. The first person to accept the lead by calling it will have the lead assigned to them. Once the lead is assigned, other agents will hear, "We're sorry, John Doe is already assigned to Agent A" when they try to call the lead. There is no limit to the number of people that can be contacted simultaneously. If no one responds and the default assigment option is left empty the lead will be left unassigned. The default permission setting allows agents to view and reassign leads. This method shows preference to one agent over the others by giving them the first chance to claim new leads. This preference is typically given because that agent has maintained a higher close rate than their peers. Johhny Closer will be called be called and text first. If he accepts the lead, no one else will be contacted, if he doesn't then Agent B-Team will be called, and if they fail to respond then Agent Backup will be called. If none of the agents have responded, the system is set to auto-assign the lead to the sales manager who will be notified via email and can then manually assign the lead and follow up with his team to find out why no one accepted the lead. With any of the push-pull methods listed above, you can add the condition of making it a 'blind' distribution. What this means is that agents will only be notified of the name of the lead with no additional information. This prevents agents from cherry picking leads and forces them to respond to every lead. To do this scroll to the bottom of the 'Notifications & Routing' page, click on 'Phone Notifications' and then click on the very bottom drop down menu that let's you control what information is read off on the lead notification phone call. 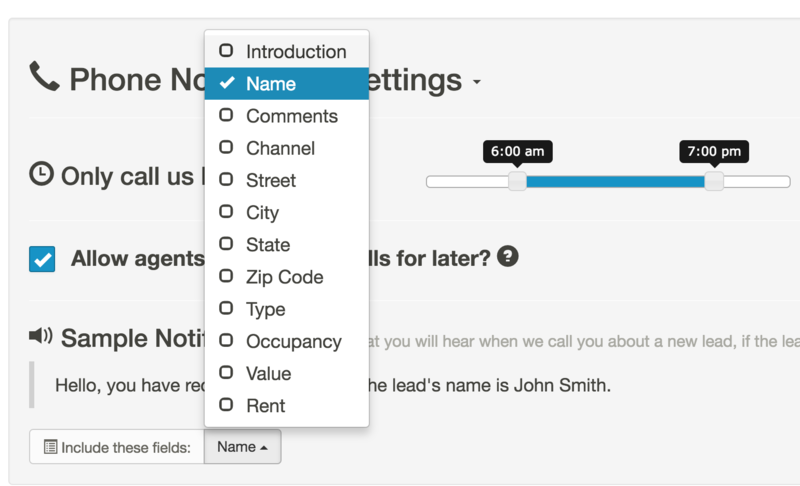 Deselect all options other than the leads name (which the agent will need to address them).